I don't why I've been putting off making crème brûlée for so long. I've had a blowtorch and ramekins for ages. I always thought it was very difficult to make, but nothing could be further away from the truth. It's really nothing more than (1) heating up some milk, cream and vanilla together in a saucepan, (2) pouring it into custard cups, (3) bake and (4) letting it cool. Brûlée-ing the crème was surprisingly easy as well, although I do recommend using white sugar instead of light brown sugar, as it burns less. Rating: 4- out of 5. Crème Brûlée: adapted from Pâtisserie Mulot. Dorie Greenspan - Paris Sweets. - Preheat the oven to 200°F (90°C). Place six gratin dishes or ramekins on a rimmed baking sheet: the ideal gratins or ramekins for this recipe are round porcelain or glass dishes that are just 1 inch high and 4 inches across (2,5 cm high, 10 cm across); they should hold about ¾ cup (200 ml). - Bring the cream, milk, cinnamon sticks and vanilla beans (pod and pulp) to a boil in a saucepan over medium heat. Pull the pan from the heat and set it aside for 15 minutes. - Remove the pods and cinnamon sticks from the cream mixture. Reheat the cream mixture; it should be hot to the touch. - Put the yolks and sugar in a medium bowl, or better yet, a 1-quart measuring cup and whisk until the yolks are smooth but not airy. Whisking without stop, drizzle in about one-quarter of the hot cream mixture, then add the rest of the liquid in a slow, steady stream. Rap the bowl against the counter to pop the bubbles that will have formed, then pour the custard through a strainer into the dishes, dividing it evenly among them; it will come about two-thirds to three-quarters of the way up the sides. - Bake the custards for 50 to 60 minutes, or until the centers are set (mine needed about 90 minutes); if you tap the sides of the dishes, the custards should not shimmy. Transfer the custards to a rack to cool to room temperature. - Cover each dish with plastic wrap and chill for at least 3 hours, or up to 2 days. The custards need to be very cold before they can be brûléed. - Sprinkle the tops evenly with brown sugar, using about 1 tablespoon for each, then torch away until the sugar bubbles and browns but does not burn. - The custard can be made up to 2 days ahead and kept covered in the refrigerator. 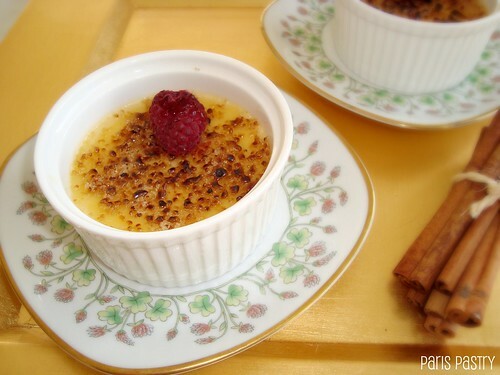 You can brûlée the sugar and chill the desserts for up to 6 hours, but if you want to have cool custard and a warm topping, serve the dessert as soon as the sugar is brûléed. Oh creme brulee, how do I love thee .... the joy of breaking through that hard top shell to find the luscious creaminess beneath ... heaven!! Looove creme brulee! Cinnamon scented must be delicioous! 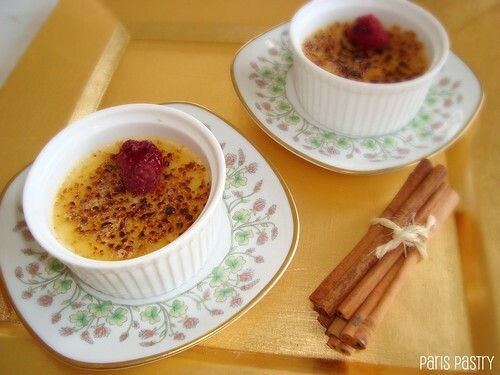 I love creme brulee, but didn't realize that it was so easy to make! I'll be making this soon...yum! Well I never...Creme Brulee is SPANISH!? Who would have guessed!? I had no idea that it was from Spain! I can't wait to buy a blowtorch so I can copy your beautiful creation! I ADORE creme brulee! It is my dessert of choice if ever we eat out (my family take the mickey out of me for it actually!) but I would never dream of making it at home ... till now. They look sooooooooo good! Great job, Danielle! Love caramelization and I'm glad you finally decided to make it. a Big Congrats as you were the winner of the Chanel nail polish !! I need your address for shipping!! :) Happy Thursday!! This looks amazing - I have always been scared to try it but this gives me inspiration! Oh how I wish I had a creme brulée torch! These look super scrumptious!